Path of Presence is about living awake. Our mission is to share and provide practical wisdom, for life and business, with those who want increased presence and peace of mind. Path of Presence is about living in the present moment - to choose a journey of mindful, intentional, embrace of radical authentic in who we've come to be. We are about living an integrated life, bringing our whole selves, body, mind and spirit, to the present moment. Our community is comprised of heart-centered, spirit-guided and vision-led souls from all walks of life. 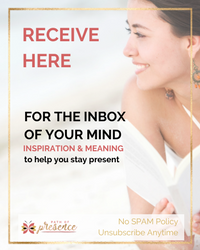 If you are a courageous soul who finds yourself on a heart-centered awakening journey, whether your path is through business, motherhood, digital entrepreneurship, blogging or otherwise, please share your wisdom, musings and knowledge with us! The sections below are highlighted so that you have an idea of what we are looking for. We are looking of you to share your experiences of what its like to live with an open heart, perhaps a bit of inspiration. What drives you? Your favorite quote, and why...? We welcome writings about intention, mindfulness, faith, joy, friendship, perseverance, family, forgiveness, healing, practice, conscious living (Especially if your piece can help others come to their own process). Sharing the journey is about not feeling alone, right? Do you have a spiritual practice that keeps you grounded? Is there a ritual that helps you stay mindful and present when you face challenges? Do you see eating and exercise as a mindful balance to support your wellness? Take a look at our current blog about the practice of presence and, if it calls to you, complete the form below. Examples: Your birthing experience (and how it changed you positively), lessons through life experience. The profound experience of rearing children, being wife, mother, father, auntie, etc. Musings of motherhood, sisterhood, wifey-hood, lady-boss-hoo :-D . - you name it! Write about your expertise and what you know. Are you an expert? Do you have tips in how to organize something? Or a personalized way to do social media on (a) particular platform(s)? Do you have a unique perspective that others can learn from? Share it with us. Take a look at our current blog line up and if you wish to write something along those lines, complete the form below. Examples: How to become more efficient, # of ways to do something, the difference between services or products, comparisons, product reviews, etc. Word count: Minimum: 1,200, upwards to a max of 2,300. as the max upper limit. Proof read your article to assure spelling and grammar are correct. In your post, provide a solution - share practical steps. What did you learn from it? What steps are there to get from where you were to where you are now? Please optimize your article for SEO (search engine optimization). Identify 3 or 4 key words that you would like your audience to search for in order to find your article. Do not worry about graphics - we will create all the graphics for the post. Please provide a short bio, a recent photo, your URL and your social media links so we can backlink to your pages. Please keep all content G rated. We reserve the right to publish only content we deem appropriate to our audience. If accepted, you agree to be ACTIVE in the comments and also share the post on your social platforms. May We contact you via Facebook Messenger? If so, what is your FB URL? Bios should be no more than 1-4 sentences, including links. All bios should have at least one link (social media/professional/personal blog). Please write your bio in the 3rd person, allowing it to be personable, reflecting both your professional and personal style. If this article has been previously published elsewhere, I hold the rights but Path of Presence can have "free to use" rights in perpetuity. Also, I have re-edited and changed the title and article itself significantly (except if noted that the material is an excerpt from a book). By submitting, I certify this is my work: original, and any excerpts of other work are cited and Fair Use or public domain. By submitting, I give Path of Presence “use rights” in perpetuity, which is a fancy word for "indefinitely." With this, I understand that I can use the article published at Path of Presence with credit and link in any publication that I own or control, such as my personal blog or website. I can re-publish my Path of PResence site elsewhere online only if: 1) I change the text by 20%; 2) I significantly change the first paragraph; 3) I change the title meaningfully; 4) you I do not use the post that is published on Path fo Presence); and 5) I link back to where it initially appeared on PathofPresence.com. If in print, I can publish the version published at PathofPresence.com with prominent credit with permission.